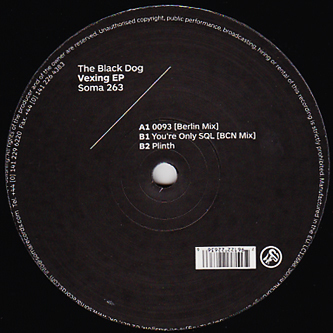 Featuring live versions and exclusive tracks not taken from their forthcoming 'Further Vexations' album, the 'Vexing EP' sees the Black Dog pursue its tail further down a dark and melancholy pit of purist, deadly techno for Soma. The live version of '0093' recorded in Berlin is the highlight here, sounding like the sum of their influences from subtle Rob Hood style rhythmic flickers to the murky and arcane atmospheres of Coil held together with a rhythmic framwork in awe of Surgeon's industrialist techniques. Tough, dark and true to its craft - highly recommended!